This is the ‘Year of Fatima Jinnah’ In Pakistan. A former bodyguard of Miss Jinnah (1893-1967) announced to the world on January 11: “To pay homage to the younger sister of the founder of Pakistan as a crusader for democracy, we will remember her by celebrating 2003 as the Year of Mohtarma Fatima Jinnah”. The bodyguard is one Mir Zafarullah Khan Jamali. He still looks the part. And he happens to be Pakistan’s prime minister. Just when you started snoozing, listening to the same old speeches on Miss Jinnah, out came the shocking news last week that she may have been murdered. Madar-i-Millat (Mother of the Nation) murdered! “Former attorney general of Pakistan and ‘honorary’ secretary of the Quaid-i-Azam from 1941 to 1944, Mr Sharifuddin Pirzada, has revealed outside a conference-room in Islamabad that Miss Fatima Jinnah did not die a natural death in 1967 but was probably murdered by a servant of hers,” (Daily Times editorial, Out with the truth about Miss Jinnah, July 23, 2003). Pakistani commentators seem ‘astounded’ by the ‘strange’ claims and ‘rumours’ spread by Pirzada (The News, editorial, July 23, 2003). Let us not forget that Pirzada is Prime Minister Jamali’s senior advisor, and that Jamali is the one who declared this as the Year of Fatima Jinnah. There may be some wisdom in letting the full story of Miss Jinnah’s death come out in the year dedicated to her memory. As the Daily Times editorial put it, “Let the truth about the death of Miss Jinnah be known after proper investigation of the claim made by Mr Pirzada and let us put the case to rest once and for all”. The story about Miss Jinnah’s death is not a new one. Below is an extract from an earlier Cam Diary. “Jinnah’s sister had the habit of locking her bedroom door and leaving the keys under the door in the morning for the housemaid to enter and attend to her. On the tragic day there were no keys and the door remained shut. Nobody dared enter. As a very close friend of Jinnah and Fatima, MAH Ispahani was called to the house. Qutbuddin Aziz, a former diplomat has dismissed Pirzada’s claim. The News reported last week that “He (Aziz) said Fatima Jinnah died in the morning of July 9,1967 and he along with his mother reached Mohatta Palace around 9 am. He said there was a red mark on the neck of Fatima Jinnah but not a cut or signs of bleeding”. Of the many e-mails received on this topic last week, one was from Dr Ghulam Nabi Kazi. He says: “It is high time that the nation attains a level of maturity whereby it can come to terms with certain realities and attempt to address certain unanswered questions relating to her (Miss Jinnah’s) life… The lady was ostracized, persecuted and marginalized to a point that people had even forgotten about her existence when she decided to take on Field Marshal Ayub Khan in the 1964 presidential elections. The manner in which the elections were conducted and their unfortunate aftermath are known to all”. Dr Kazi ponders, “What is the real truth? Will the teeming millions of Pakistan ever be considered worthy enough of being taken into confidence about these pranks played by a few chosen ones? And those naïve people amongst us who think that our Press is free should reconsider their opinion. The real truth is simply not for consumption of the ordinary mortals in Pakistan”. It is unlikely that the people of Pakistan will come to terms with their true history without being subjected to ‘grief, shock and awe’. 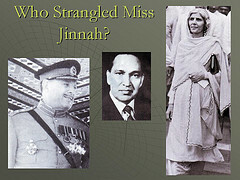 And who strangled Miss Jinnah? Even if not physically throttled, she was strangled by the ‘system’. Like millions of ordinary people every day. About Mohtarma Fatima Jinnah She was born in Karachi on 30th July 1893. The Late Miss Jinnah was a boarder of Convent School, Bombay from 1902 to 1906. She joined St. Patrick School (Gandala) in 1906 and passed Matric in 1910. She passed her Senior Cambridge as private candidate in 1913. The Mohtarama joined Dr. Ahmed Dental College, Calcutta, the only Dental College in India in 1919 and qualified as a Dentist in 1922. Established a private clinic on Abdul Rahman Street in Bombay and also gave free service at Dhobi Talloo Municipal Clinic. 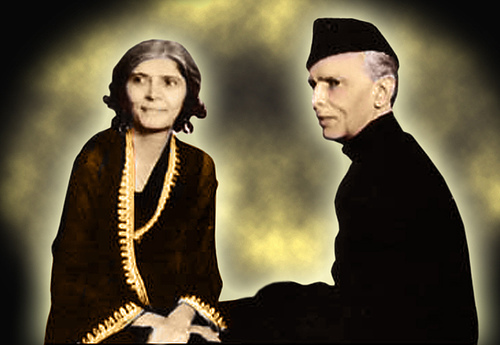 In 1929,Miss Jinnah joined Quaid-e-Azam in the struggle for creation of Pakistan. In so doing she sacrificed her professional & private life. She was a source of great inspiration to him during difficult times. Indeed, the values that Miss Fatima Jinnah exemplified in her life-time are still relevant to us. While they are a source of inspiration to us in our present predication, her life provides us with a role model. Why Mohtarama Fatima JinnahDuring the national presidential election campaign of 1964 late Ms. Fatima Jinnah, the younger sister of Mohammad Ali Jinnah, the Founder of Pakistan, expressed the wish that their should be a dental college at Karachi. Dr. Baqar Askary who was then the President of the Dow Medical College Students Union and President of National Students Federation while supporting Ms. Jinnah’s election campaign promised that a dental college would be established in Karachi. The campaign was launched in Dec. 1988 and by mid 1989, it was made clear that the Government had no intention of establishing a dental college at Karachi. However, the Federal Government in its Health Policy announced later, allowed medical & dental colleges to be established in the private sector Establishing a Private Dental College in Karachi : The FJDC StoryIt is a pioneer institution devoted to the teaching of dentistry, independently and not as a department of any medical college. The college is named “Fatima Jinnah Dental College” to pay respects and dedicated to the memory of Late Mohtarma Fatima Jinnah, who was herself, a Dentist. Her publicly expressed desire that there should be a dental college at Karachi was at last fulfilled. This college was established in the University of Karachi academic year 1992-93. It is significant, that 1993 was the centenary year of the birth of the Mohtarma and the establishment of this college is a gift to the Nation on this auspicious occasion. With intimation to the Federal and Provincial Ministers of Health, the Pakistan Medical & Dental Council and the University of Karachi, Fatima Jinnah Dental College was born on the map of Pakistan. The Fatima Jinnah Dental College was established and is being run and managed by a duly registered Fatima Jinnah Dental College & Hospital Trust. It is a public charitable Trust with Syed Hashim Raza, one of the very senior civil servants and the administrator of the Estate of Quaid-e-Azam Mohammad Ali Jinnah, the founder of Pakistan, as its Chairman. Fatima Jinnah Dental College has produced over 600 top dental professionals. The college today boosts to be the largest in the country and second to none. Congradulations for the achievements made in the field of Dentisry with a vison to serve the citizens of the country. Fatima Jinna Dental College, Karachi is a promise of Ms. Jinnas Election campaign in 1989. I take this oppertunity to wish every success to this great institution and the Board Members of the Trust.